There's been some friction regarding Auburn Street in Waterloo between the city and the local residents regarding traffic calming measures. This post is not about that. "We know that most of the speeders are those who live in the neighbourhood. It's frustrating." How could anyone be speeding past that obvious "children playing" sign? This touches off something I remember from a Kitchener city council discussion on raised crosswalks for Williamsburg Road. Council observed that because 92% of traffic was local, the speeders must be among the same local residents calling for traffic calming. 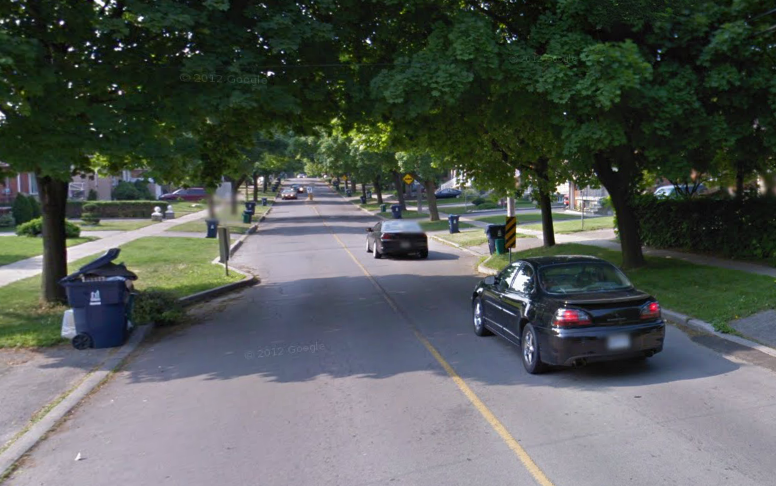 Some people have expressed the sentiment that instead of calling for traffic calming, local residents should just drive slower in their own neighbourhood. It's obvious, isn't it? It's despicable that someone would speed in their own neighbourhood, on the same streets their own kids may be crossing. If we could only get people to see that, they'd drive slower and more carefully, at least on their home turf. Right? But that idea leaves me feeling a little hollow. Why, for instance, is there not a similar outrage to drivers who speed through the neighbourhoods of others? If it's despicable to endanger your own kids, why is it not considered as bad (or worse) to endanger a stranger's family? And then, of course, there's the troublesome issue that asking people to drive more slowly... doesn't work. Nor does arbitrarily reducing speed limits (at least, not without taking other steps.) We tend to drive on streets at the speed we feel comfortable at. On wide open roads with no parked cars, gentle sweeping turns and few obstructions, we naturally drive fast-- often faster than the posted limit. It doesn't matter where we are, and whose kids are crossing the road. Perhaps near home, our comfort level goes up with familiarity, and we speed up a little, take corners we've taken a hundred times before a little faster. But we can't stop that by wishing it away. Unfortunately, as the cliche goes, speed kills. If we could reduce vehicle speeds, especially on neighbourhood roads, not only would accidents be more avoidable, but they'd also be less lethal. So how do we really get people to slow down? 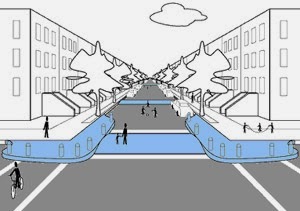 The answer lies mainly in the design of our streets, and the ways that design can influence our behaviour. Some design measures, like speed bumps, have serious unintentional effects in impeding and damaging transit and fire vehicles. But other measures exist: steps like narrowing the roadway, providing crossing islands, or reducing crossing distances at intersections with neckdowns can cause us to unconsciously drive a little slower. The presence of on-street parking in a tighter environment also contributes to an instinctive lightening of the gas pedal. Unfortunately, in suburban neighbourhoods, that can be impeded by the design of the houses themselves reducing the amount of room to park along the curb. It's important to note that these measures can all help, but we don't really have a silver bullet. There has been growing talk in North American cities that we'd be better off with a 30km/h speed limit (as well as the predictable knee-jerk reactions against it) but that's the cart, not the horse. To actually be able to change a city speed limit, the streets in our city must first bring traffic down to that number by design. Which helps explain why complete streets, and rightsizing of overbuilt roadways, are all important. So it's good to note that while some measures have been rolled back due to residents' objections, some of the Auburn Street calming measures (such as raised crosswalks) will still proceed. Even then, traffic calming won't be enough on its own. 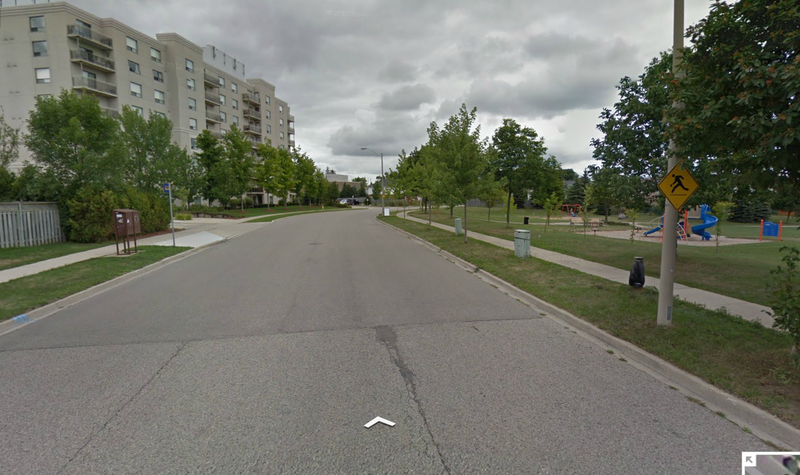 A family member has pointed out his tree-lined, parking-lined, narrowed and speed humped street with a 30km/h speed limit as a place where, despite all these measures, some people still drive like idiots. Maybe these measures help to alleviate the problem, but they can't solve it. It looks pretty nice. Maybe there's a Reckless Drivers Anonymous up the road? So maybe, for lack of any magic bullet improvement, we should still ask people to drive safely. It can't hurt. Can it?